simil -- Edit-distance similarity measurements. -r reverse the order of the input and template files on the command-line (so that one or the other can be input from standard input or piped from another command). -x # variable template mode, examining template substrings of length # (which is less than the length of the template). -N Ignore null records in source spine. -R Raw edit distances. Do not scale or normalize the edit distance values. --d1 # Change the score for deleting a non-repeated token in the source string. --d2 # Change the score for deleting a non-repeated token in the template string. --r1 # Change the score for deleting a repeated token in the source string. --r2 # Change the score for deleting a repeated token in the template string. --s0 # Change the score for substituting a token that is repeated in neither the source string nor the template string. --s1 # Change the score for substituting a token that is repeated in the source string only. --s2 # Change the score for substituting a token that is repeated in template string only. --s3 # Change the score for substituting a token that is repeated in the source string and in the template string. The simil program measures similarity between two sequences by using the Damerau-Levenshtein distance, which is the minimum numbers of editing operations needed in order to transform one sequence into another. Edit distance measures how many insertions, deletions and substitutions are needed in order to convert one sequence into another. Suppose that you want to convert the letters in "DESK" into the letters in "RAVEN". The following figure shows all of the possible insertions, deletions and substitutions which can be done to their letters when converting between the two words. 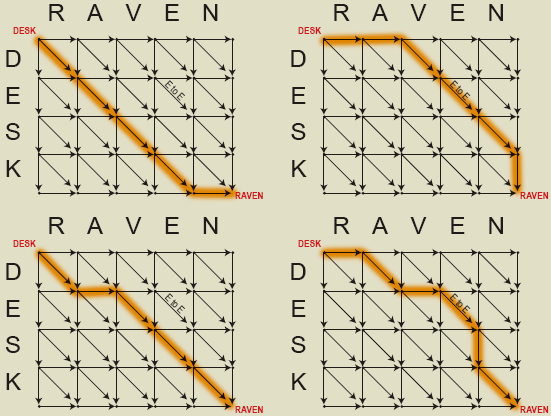 There are many paths through the above grid which can be followed from "DESK" at the top left corner to "RAVEN" in the bottom right corner. However, the most interesting path(s) is the one which takes the fewest steps. In this case, it takes at least five steps to get from DESK to RAVEN. The following figure highlights four possible paths which each require five edit operations. 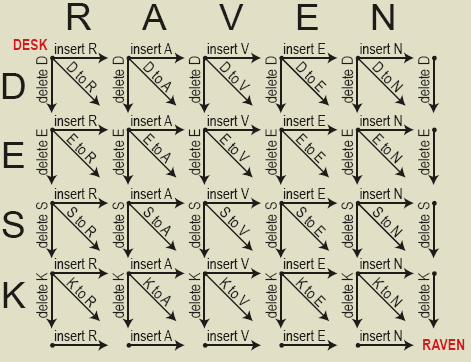 Substituting the letter "E" in DESK for the letter "E" in RAVEN is assigned zero cost, while all other segments are given a cost of one unit. The simil program requires two inputs: (1) a source file in the Humdrum file format, and (2) a search template file containing only a sequence of search strings. The resulting output is a Humdrum file containing a list of similarity measurements. In this case, each line of the output file gives the similarity of the template sequence to a sequence in the source starting on the same line of data. For example, the first similarity value of 0.51 is the similarity value between the string "ABC" in the template when compared to the first three data tokens in the source file: "XAB". A similarity value of 1.00 indicates an exact match, so notice that the second similarity value compares "ABC" in the template to "ABC" in the source file starting on the second line of data. Values towards zero indicate less similarity between the search template and the source data. By default, simil scales the edit distance scores by the equation: e-d/L, where d is the raw edit distance score, L is the number of elements in the template sequence, and e is 2.718281828.... If you want to see the raw edit distance scores which are inverted such that 0 indicates an exact match and larger values indicate less similarity, then use the -R option. The -n option is a unnormalized variant of the default output, where the similarity score is mapped with the equation e-d. The -R option makes is clearer what has happened in the comparison of "ABC" to "XAB". In this case the 2 is generated by deleting the "X" at the start of the source sequence, and adding a "C" at the end of the source sequence. In this case, the highest similarity (0.56) occurs when the sequence "ominously, phantasia, and phantasma" lines up between the source and the search template. The value 0.37 represents the case when there is no similarity between the source and template. By default, all editing operations cost the same amount (1.0 units). However, you can alter the default values in two ways: (1) by loading them from a initialization file, or (2) by changing the weights from the command-line. Note that the two dashes in front of the edit rule option names are required since the option name length is more than one character. The editing rule abbreviations are case insensitive in both the initialization file and in the command-line options. So, for example, "D2" and "d2" can be used interchangeably. By using the -x option, you can search for the best substring match from the template in the source at each point. For example, with a template of the letters "ABC" and the option -x 2, all substrings of length two which can be generated from "ABC" will be compared to the source data, and a list of the top matching subsequences will be included in the output analysis. The **simixrf contains a list of integers which indicates the position of the substring(s) in the template which best match the source file at each position. In this case there are two substrings being compared to the source data: (1) "AB" and (2) "BC". When there is a similarity measurement tie between two or more substrings, indexes for all best-matching substrings are displayed, separated by commas. To output an extra spine containing the tokens sequence used from the source file for a particular simil score, use the -s option. Additionally, the -S (capital S) option can be used to suppress a space from being printed between the successive elements in the sequence. In the output, lines with simil scores less than the threshold value are displayed as null tokens so that the relative locations of the values are preserved. You can remove the null token lines by piping the output into the Humdrum command "rid -d". As an example application of the simil program, consider these transcriptions of the Exultet (Easter Proclamation) in 28 manuscripts from the 13th and 14th centuries. In these sources, the most common 15-note diatonic pitch sequence is GFGAGAGFGAGAGFF, which occurs 270 times in the 28 sources (use the "context -n 15" and "kern -x" commands on the data files to verify -- removing editorial rests and accidentals). Scroll through the output column above and look for a value of 1.00 in the first column. Whenever this occurs, the sequence GFGAGAGFGAGAGFF will be found in the second column starting on that line. To see patterns in the occurrence of the sequence, it is more illuminating to plot the edit-distance similarity measurements throughout the music as shown below. 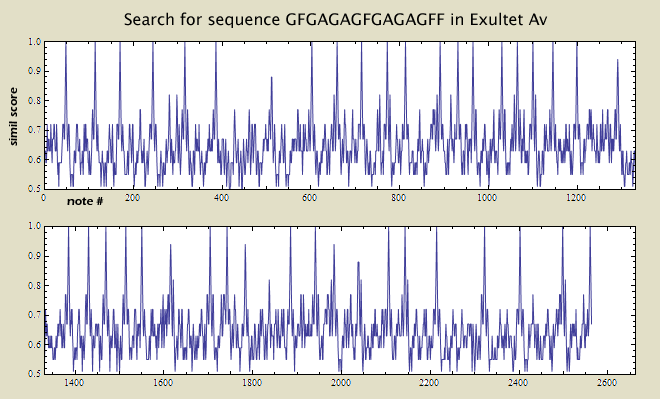 In Exultet source M2, however, the sequence GFGAGAGFGAGAGFF never occurs. Instead, the sequence has been altered. The following command displays the sequences in the M2 source which are most similar to the template sequence. In this case GFGAGAGFAGAGFFG is the most common pattern which substitutes for GFGAGAGFGAGAGFF. 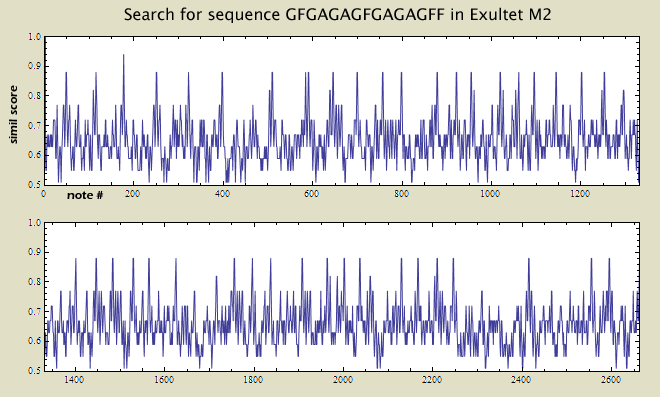 When comparing the two sequences, the last G in M2 should be ignored since the limit of 15 notes in the analysis may have chopped the G from the end of the sequences in the Av source. Orpen, Keith and David Huron, "Measurement of similarity in music: A quantitative approach for non-parametric representations," Computers in Music Research, Vol. 4 (1992), pp. 1-44. Hall, Patrick A. V. and Geoff R. Dowling "Approximate string matching," ACM Computing Surveys, Vol. 12, No. 4 (Dec. 1980), pp. 381-402. Navarro, Gonzalo. "A guided tour to approximate string matching," ACM Computing Surveys, Vol. 33 (2001), pp. 31-88. Humdrum Toolkit's simil documentation which also applies to the simil program except for the usage of the initialization file, simil.rc, which must be read using the -w option in simil. The source code for the program was last modified on 8 Dec 2009. Click here to go to the full source-code download page.